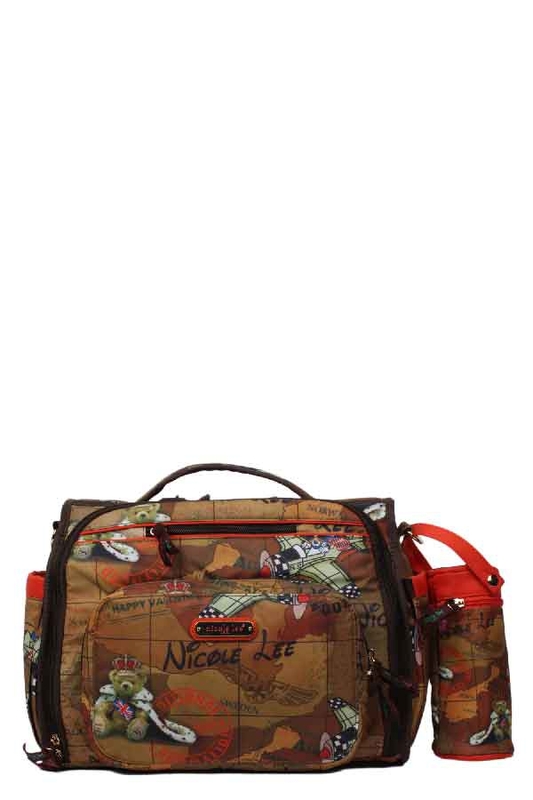 Keep your little one comfortable and happy with the help of the stylish and spacious Nicole Lee Mabel Diaper Duffle Bag. Exterior Features: Made of nylon, NL print all around, detachable bottle holder, open side pockets, zipper pockets, bottle holder, zipper closure, adjustable shoulder and crossbody strap, zipper closure and Nicole Lee signature nameplate at front. Interior Features: fully lined, back zipper pocket, 3 open pockets, front large pocket with velcro closure, clear blag included and matching changing diaper mat. Vegan leather handles with 8" inch drop.Includes adjustable and detachable 25" - 45" inch shoulder strap.